Cheers to You Mami Shy! Today is a very special day of Tsang Shy (Sheila/Shydub/Shei). Happy Birthday to you Tsang! It's such a lovely thing for me to have you Tsang as a friend. You are one of my online friends who understands me, on whom I can share everything. You see and know my faults and like me anyway, and you never seem to take offense at anything I say. Your friendship is a precious gift and I will always treasure you. even truly hugged and yet! me by the kindness that you give. together doesn't matter where we live. heart you have a special place. Happy Birthday Ma'am Shei! 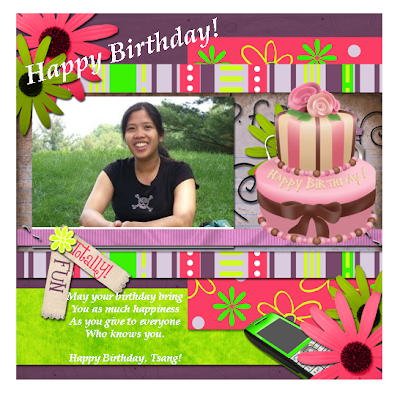 If you guys have time, please hop on her blogs and greet her on her special day. Thanks!